Caramel Apple Chex Mix - Sweet, Tangy and perfect for fall! 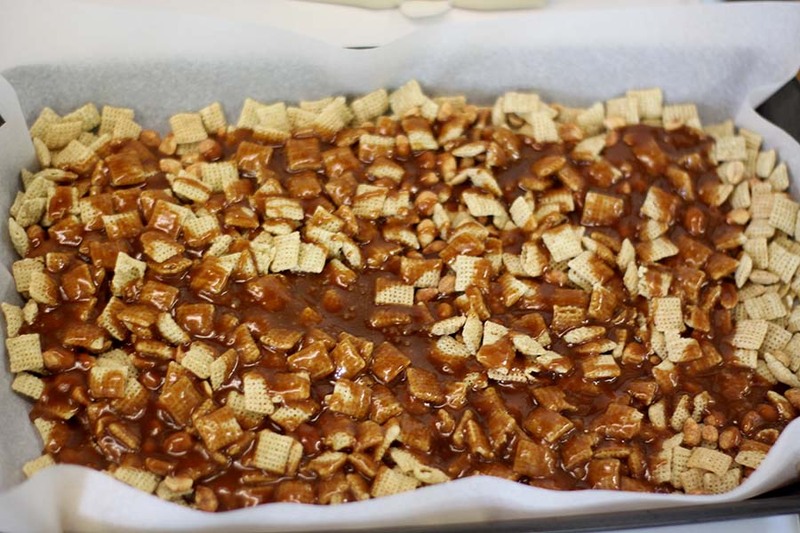 Caramel Apple Chex Mix is a perfect tailgating or fall bake sale treat! Sweet, caramely and tangy. This delicious fall treat won’t last long! This post contains affiliate links. Can I be a little honest about football season? I’m really just here for the food. Like football food is absolutely the best so I would attend any and all tailgates just to have a shot at the food table. And if it wasn’t for my husband’s team, I would feel tempted to sit where the best football food was at any tailgate. Hey, I don’t see team colors, my eyes are on the dip and snack selection :). Make sure yours is the best table at the tailgate with Caramel Apple Chex mix! To me, the three powerhouse flavors of the fall are caramel, apple and pumpkin. Combine any two and you’ve got magic. 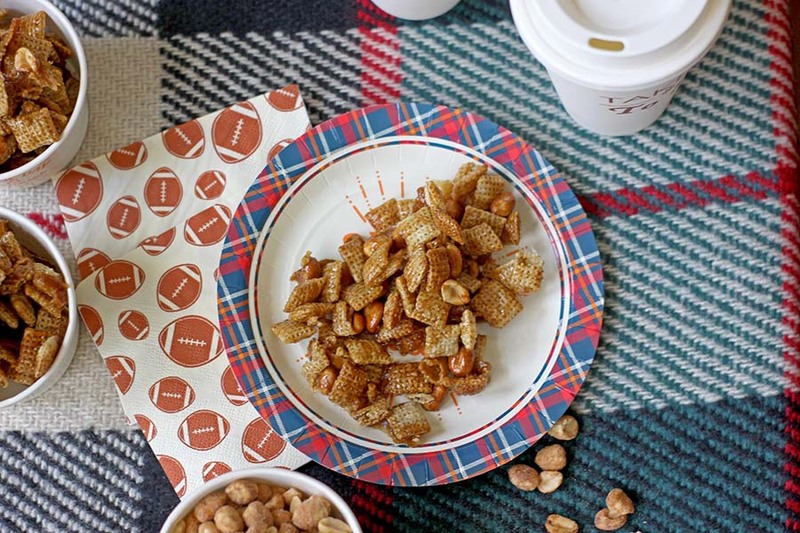 This sweet chex mix recipe is also a perfect fall make and take because it’s not dependent on any certain temperature. Since I live in Illinois — where in the fall we need every single piece of clothing we own ready to roll at a moment’s notice — from shorts to parkas — this is perfect no matter the weather and transport is a snap. The secret ingredient here is apple cider mix, which can be found in the coffee/tea/hot chocolate area. They usually only have one or two selections of this at the store, so it takes a second to find it amongst the 10,000 hot chocolate selections. You’ll also need brown sugar, butter, nuts, and Chex. 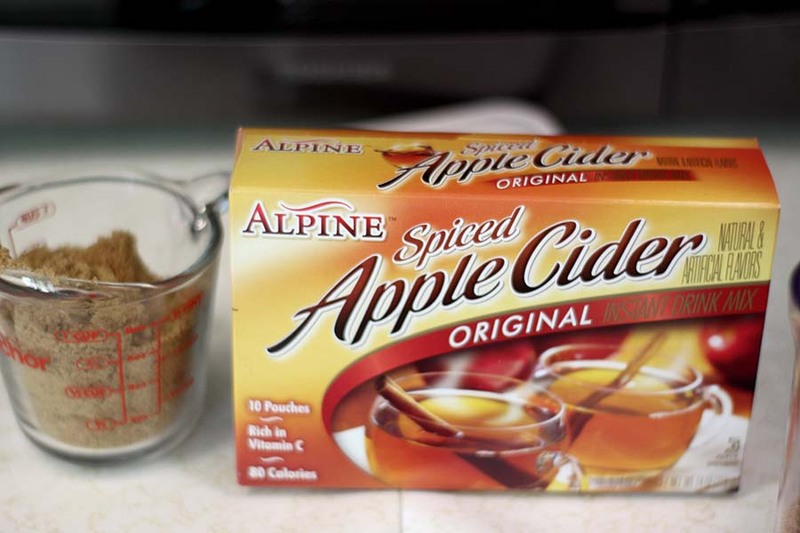 Bring your butter, brown sugar and apple cider mix to a boil. I used all 10 (yep, 10) packets in the box — you need it to get the right tangy flavor, and it’s not overwhelming at all. I found that it worked best to melt my butter completely and then stir in the brown sugar and cider mix packets and boil for 2 minutes, stirring constantly. 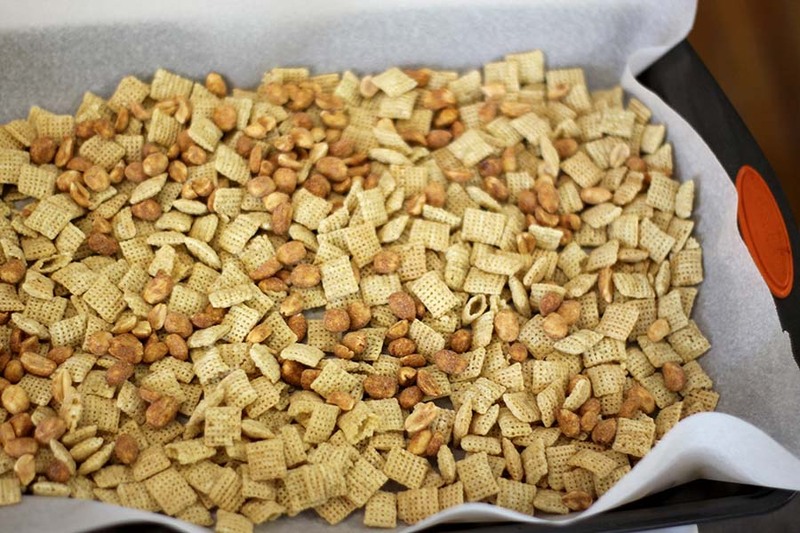 Spread out your Chex mix (I did Rice Chex, but any plain type of Chex or mix of different Chex types would work for this) on a baking sheet lined with parchment paper. You’re definitely going to want to do parchment paper to cut down on the clean up. I found these cookie parchment baking sheets here that I am so ordering for next time! I threw in some honey-roasted peanuts for this one, but totally optional. My sister has a really nuanced system for if nuts are okay in desserts (no in baked goods or ice cream, yes in snack mixes), so I threw these in here, but totally up to you. 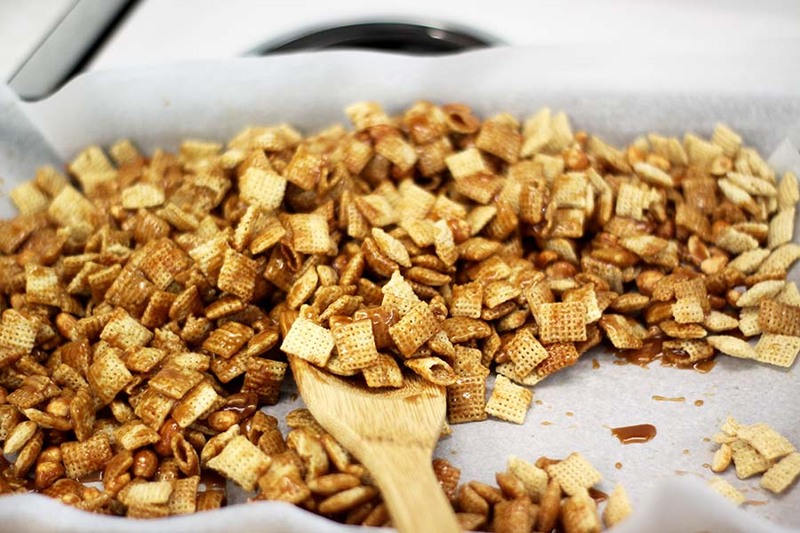 Drizzle the brown sugar mixture on top of your Chex/nuts, but don’t stir at this point. Pop it in a 350° oven for 8 minutes. 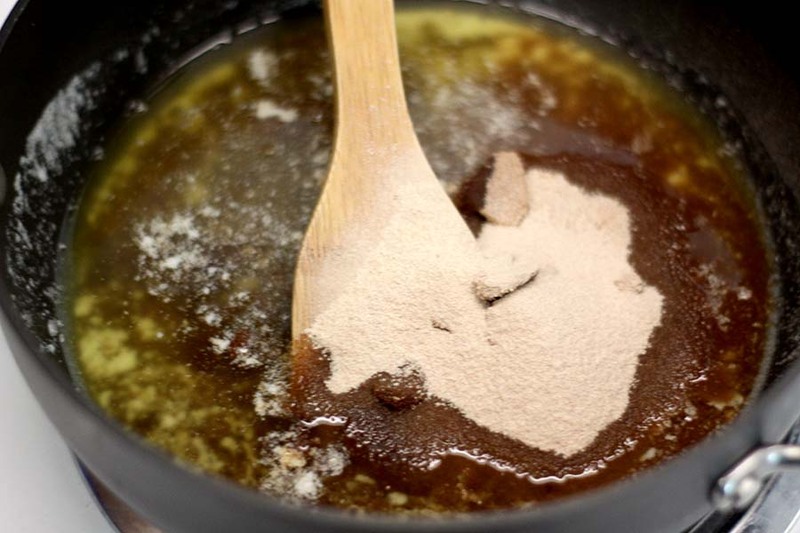 After 8 minutes, bring it out and stir it — really get underneath the mix because the caramel likes to sink to the bottom. Pop it back in the oven for another 8 minutes. Right when you pull it out, really give it another good stir, especially along the bottom to make sure the caramel didn’t sink down. Now one thing about this recipe, is you need to let it cool completely. It’s still tasty right away, but it will absolutely make you feel like you’re going to seal your jaw shut, Sugar Babies style if you eat it right away. It’s not sticky at all if it’s cooled, so try to wait if you can, hehe. Let it cool for at least an hour and then just break up the hunks with a spatula. 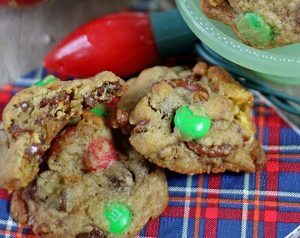 Package it up for a bake sale, take it a sealed container for tailgating, or just eat it up! I found my football tableware at the Target Dollar Spot, but couldn’t find it online to link to it — something similar below from Amazon. Caramel Apple Chex Mix is a sweet and tangy fall treat that's perfect for tailgating, bake sales, or just to have around the house! I’m afraid I wouldn’t be able to stop eating this! Boy, this snack mix looks terrific! 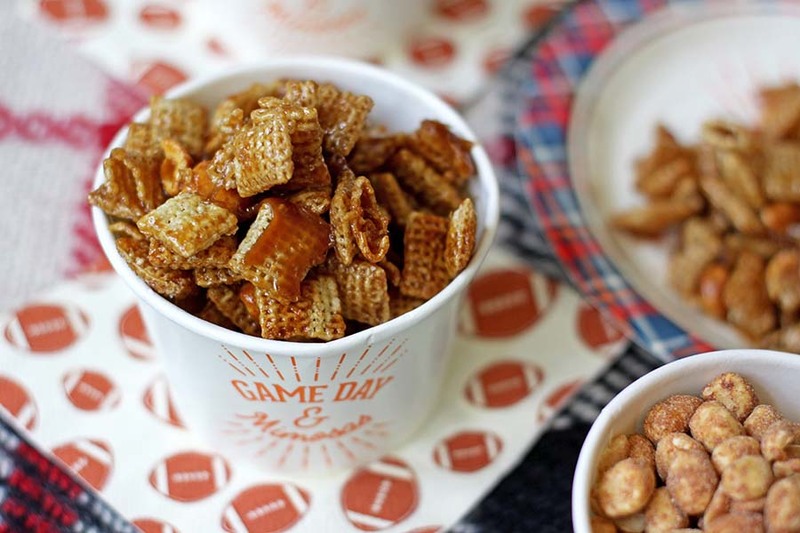 I love anything “caramel,” so I know I could eat my wait in this Chex mix! This looks delicious & tempting.Thanks for bringing this recipe to Fiesta Friday! Thanks Debanita! It’s a new fall favorite for sure. Thanks for stopping by! This is so delicious!! Thank you for the recipe. Now the real reason for the comment here. I was always guilty of putting a stiff martini in a coffee mug during that hour of sitting with the kids helping with homework every night. ( they thought it was coffee until my son got to the 10th grade!) Then he blew my cover! I’m so glad you liked it! Okay, I am laughing so hard — that’s a next level parenting hack! I’m going to use that!